Mike Terry represents plaintiffs and defendants in complex commercial and appellate matters, as well as class actions. Over the past 15 years, his practice has focused heavily on appellate litigation, particularly in the areas of class actions and punitive damages. He is a Fellow of the American Academy of Appellate Lawyers, an organization founded to advance the highest standards and practices of appellate advocacy and to recognize outstanding appellate lawyers. Mike recently argued and achieved a 7-0 victory before the Georgia Supreme Court in a challenge to the constitutionality of the state’s caps on pain and suffering damages in medical malpractice cases. In 2016, Mike argued and achieved a 7-0 reversal of the denial of class certification for a class of consumers alleging they had been charged usurious fees by their Bank. In 2015 Mike was selected by the Council of State Court Judges of Georgia to represent that body in a Georgia Supreme Court challenge to actions taken by Georgia Judicial Qualifications Commission. That case remains pending. 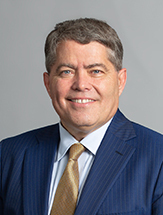 A strong supporter of the Atlanta legal community, he recently served as president of the Atlanta Bar Association, where he set a focus on judicial funding and services for lawyers in transition. He is also a member of the Board of Governors of the State Bar of Georgia. Mike is a frequent lecturer and author on business litigation topics including class actions, punitive damages and appellate issues. He is also often asked to moderate debates and panel discussions involving judges. Co-counsel for successful plaintiffs in a breach of fiduciary duty case which resulted in a $454 million jury verdict that was affirmed on appeal. Appellate counsel for defense that successfully reversed a $457 million judgment against one of the world’s largest forest product companies, Weyerhaeuser Co.
Appellate counsel for plaintiffs in Bogle v. McClure, which affirmed an award of $16.6 million to seven employment discrimination plaintiffs. Appellate counsel for defense in obtaining reversal of an intermediate appellate decision certifying a class action to pursue a $110 million claim under the federal Telephone Consumer Protection Act. Obtained dismissal of four putative class actions against not-for-profit hospitals challenging the hospitals’ pricing policies, and appeared as lead appellate counsel for the hospitals in having those cases affirmed on appeal. Appellate counsel on behalf of a major peanut processor in obtaining a new trial following a $20 million jury verdict. Appellate counsel for a class of policyholders in upholding class certification of a case involving credit life insurance. Retained to submit amicus curiae briefs (and at times to present oral argument on behalf of amicus) on behalf of the Democratic Party of Georgia, the ACLU of Georgia, the Medical Association of Georgia, the Hospital Authority of Clarke County, and the Georgia Canoe Association. Georgia Rejects The Copperweld Intra-Corporate Conspiracy Defense: Will The ‘Stranger Doctrine’ Survive? Best Lawyers’ 2016 Atlanta Appellate "Lawyer of the Year"